April, 1971. In the 15 months since the last blog entry, Doctor Who has settled into its new, Earthbound format. 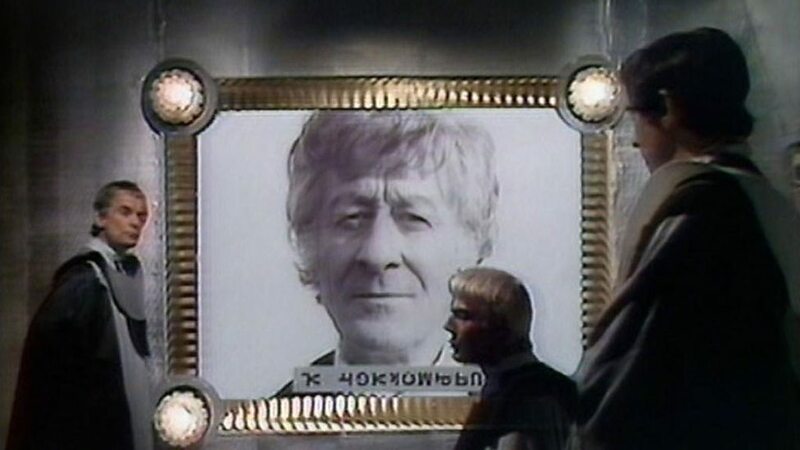 Season Eight began in January with a sequel to Spearhead from Space that was most notable for introducing a new Time Lord villain, the Master, who went on appeared in both subsequent stories. We’ve just finished The Claws of Axos, and had our first glimpse inside the TARDIS in colour. And then, sneaking in sheepishly to the season’s graveyard slot, there’s Colony in Space. The title of the story tells you from the off that this is a break from the series’ new format. And if that’s not clue enough, the very first scene takes us back to the planet of the Time Lords, last seen in Hulke and Dicks’ The War Games. Reflecting on its decision to exile the Doctor to 20th Century Earth, the Time Lord tribunal realises that he is probably more useful to them if he has a degree of freedom. Particularly since the Master has stolen their secret files on the doomsday weapon. We then cut to Earth where the Doctor and his new assistant Jo Grant indulge in a bit of business with the Brigadier, who’s still hunting the Master. Having been fiddling with the TARDIS dematerialisation circuit all season, the Doctor is convinced that he’s finally repaired it, and he intends to test it with a trip into space. Terrance Dicks has frequently claimed that he was never a fan of the trapped on Earth format, and that it was Malcolm Hulke who pointed out to him that it essentially limited the scope of the show to two stories: alien invasions or mad scientists. For Season Seven, Dicks challenged Hulke to come up with another option, which he duly did – Doctor Who and the Silurians is probably the most creative solution to the problem. But that only takes it to three, and they have five slots to fill. So, again Dicks has challenged Hulke to come up with a new type of story. But instead, Hulke submits this: a return to the adventures in space and time of the Hartnell era. This is absolutely the right moment to tell this story: the trapped on Earth formula is becoming repetitive, and although the Master has livened the show up, giving the Doctor a sense of purpose he lacked the previous year, Barry Letts and Terrance Dicks must have been aware that even this had a limited shelf life. Although Malcolm Hulke hadn’t written any of the second Doctor’s space adventures (Robert Holmes would have been the more obvious choice), the indications are that he was Dicks’ most trusted collaborator and therefore the writer of choice to write the pilot of the show Letts and Dicks want to make. Even so, he doesn’t get it entirely right: aside from a bizarre flower Jo picks in the first episode, the planet Uxarieus is pretty dreary, and Hulke spends a lot of time showing how miserable and hard life is for the colonists. The last Earth colony we visited, in 1967’s The Macra Terror, was a much jollier place. These colonists fret about their crop, complain and the government and generally seem like the English working class transplanted onto another planet. Hulke shows his socialist credentials by having them be the victims of a rapacious corporation, IMC, which is willing to resort to terror tactics and murder in order to force them off their land and set up mining operations. The main plot, a six-episode feud between colonists and IMC staff, largely consists of a series of reversals where one side temporarily gains the upper hand and holds the other at gunpoint, with a lot of wandering between the bridge of the IMC spaceship and the main dome of the colony. It all goes on far too long, and could have been better structured so that the story escalates in two episode chunks – the first pair focusing on the IMC attempts to scare off the colonists with their lizard robot, the second on the Master’s arrival and all the complications that creates, and the last on the real secret of the planet: the hidden city and its doomsday weapon. By running all three plots in parallel, Hulke makes the whole thing drag. But that isn’t to say this isn’t a hugely influential story. Hulke’s view of Earth – a polluted and over-populated wasteland – becomes the standard future history of our planet as explored in subsequent space-based Pertwee episodes, while the environmental concerns raised here are further developed in The Green Death and Invasion of the Dinosaurs. These, in turn, inspire a later generation of writers who keep returning to the ideas – and the settings – in the New Adventures. Another key change is that the Primitives aren’t evil monsters. They’re an alien civilisation. Malcolm Hulke’s Pertwee stories have already tried to get away from the simplistic Troughton era approach of alien equalling evil through having the Silurians and the alien Ambassadors being fundamentally no different than people. Pertwee’s greeting – “How do you do?” – to the alien priest in the hidden city is an obvious repeat of his cheery greeting when he first meets a Silurian, but it’s still a welcome change from the second Doctor, who was fundamentally suspicious and mistrustful of anything that didn’t look human. Here, the Doctor is genuinely excited to show Jo the strange glass paintings of the Primitives, attempting to understand their history, respecting their culture as he did the Aztecs’ or the Didonians’. And in the next year we get a story where the Doctor is shown to be wrong when he automatically assumes the Ice Warriors are evil, and another where the monsters are actually the good guys and it’s the Earth Empire that’s evil. All these suggest a production team keen to move beyond the simple morality of the Troughton episodes. Then there’s the final showdown between the Doctor and the Master at the heart of the doomsday machine. The weapon is shown to have been responsible for causing mutations in the people of Uxarieus, and rendering the planet barren in another pointed reference to current affairs (as the Doctor points out, once doomsday weapons are developed they are usually deployed). While they’ve danced round each other in the past three stories, and it’s become customary for the Master to try to tempt the Doctor into joining him, their exchange in the sixth episode gets to the heart of their differences. “Look at all those planetary systems: we could rule them all,” says the Master. “What for? What’s the point?” replies the Doctor. “I want to see the universe, not rule it.” It’s such a nice line, Russell T Davies references it in the confrontations he writes for his Doctor and Master. So, although as holidays go it’s more of a weekend in Bognor than a fortnight in Malta, Colony in Space is a powerful restatement of the basic principles of a series that is at risk of forgetting them. Despite its plodding plot, there is no way that this story could have been told in the trapped on Earth format. And although it introduces no memorable new monsters, its whole approach to exploring alien planets is more engaging than anything the series has done since the Hartnell era.